One of my favorite breakfast/dessert from the hawker center in Singapore. In this recipe, every mouthful is filled with beans and you can feel the texture and satisfaction. 1. Wash and soak Mung Beans for 9 hours. Remove loose skin and drain. Bring beans to a boil in a pot of water and boil for 5-10 minutes, check the beans frequently during the last 5 minutes, The beans should swell and become tender but should not split. Drain and immerse in cold water to stop the cooking. Spread beans on a large tray to stop the cooking. 2. Boil (A) in a saucepan over moderately high heat for 10 minutes till sugar turns syrupy. Remove the pine leaves when done. 3. Mix the (B) and strain into a medium size pot. 4. Boil (C) for 15 minutes, discard the pine leaves. Pour (C) (still boiling) slowly into (B), stirring constantly. The liquid will turn glue-like. Add the syrup, and bring the mixture to a boil over medium low heat. Add the beans and bring to a boil over low heat. Do not overcook the beans. 5. Serve hot in a small bowls with slices of Chinese crullers. Timing is very important. 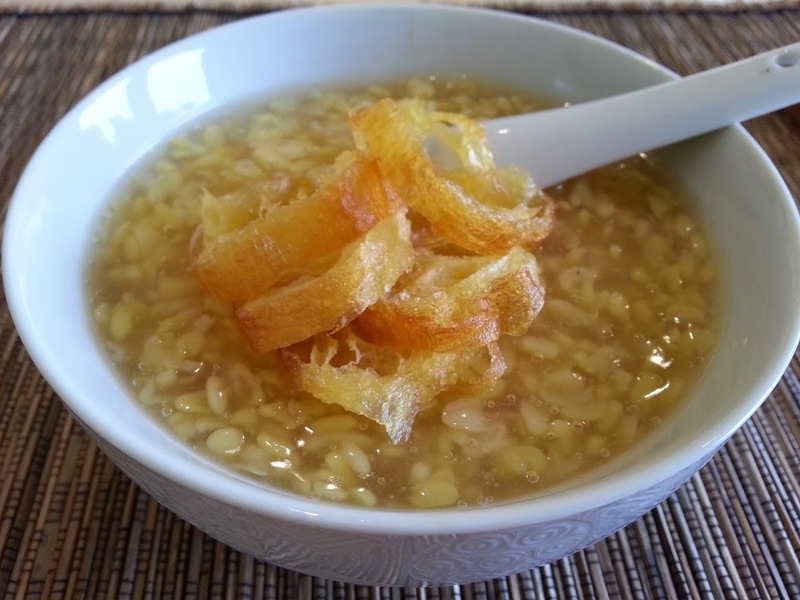 You don’t want to overcook or under-cook the mung beans, otherwise, it will not have the right texture for this dessert. 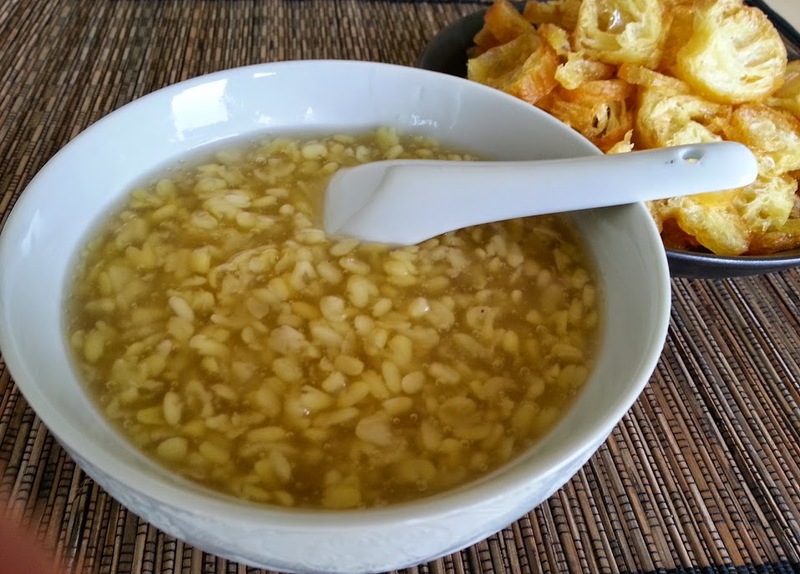 This looks so good and quite similar to 糖水 we have here in Hong Kong! Thank you. We eat it as breakfast or dessert in Singapore. I like your food blog. I love this dish! Can we use pine leaves from any pine tree or is there any particular pine tree? Help! Hi Rebecca, the leaves are called pandan leaves in south east Asia. They look like this and smells very fragrant. https://en.m.wikipedia.org/wiki/Pandanus_amaryllifolius. You can find them in Asian Grocery stores.